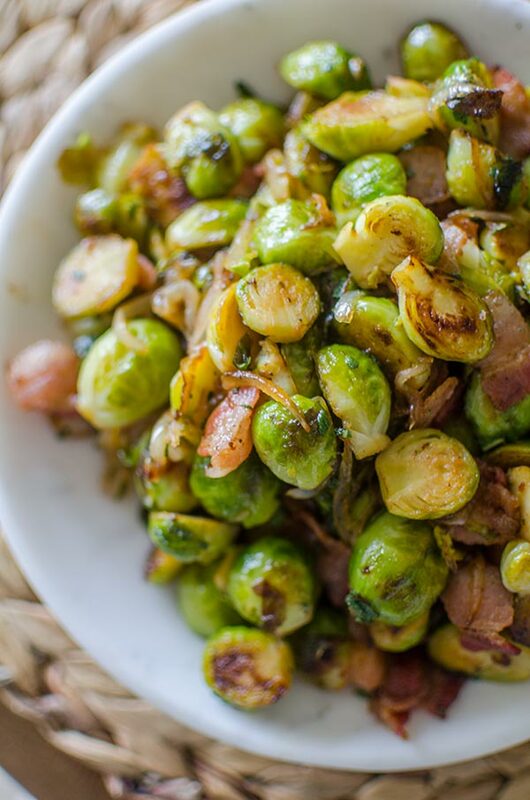 Make the best Brussels sprouts this holiday season with this recipe for Brussels sprouts with bacon and onions with sage and maple syrup. At this point, we all know there really is no such thing as a new recipe. This doesn’t really bother me at all. People have been playing around with and cooking the same ingredients forever; by this point, you’d hope that we’d have at least figured out the best ways to cook things. 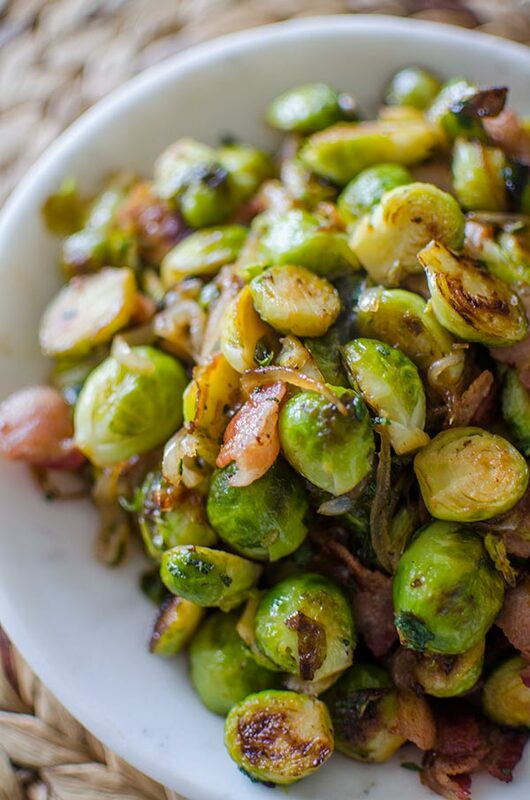 There are certain combinations that just work, and Brussels sprouts and bacon is just one of those things. This recipe is based off a bunch of those combinations of things that just work. Bacon and onions. Maple syrup and bacon. Brussles sprouts with cider vinegar. Sage with Brussles sprouts. Do you see where I’m going with this? These truly are the best Brussels sprouts. So the idea that there are no “new” recipes could be somewhat stifling for some, but for me, when I’m creating recipes and cooking it’s because I want to make something good. I want to make something for someone that they will love. I’m not cooking to make something “new”. I know there are people who do that, but I’m not a world renowned chef. I’m not on Chef’s Table. I’m Louisa and I love cooking because it’s my creative outlet of choice. I love cooking because I love to eat good food. I love cooking because I get to make food for people and see their reaction after the first bite. I started a blog because I love to cook and I love to write. And all these years later that’s still what I love. And while it wasn’t actually Thanksgiving while I was eating these Brussels sprouts straight out of the pan, I did feel very thankful. Thankful for so many things, but mostly for this season of life that I’m in. I always start to feel introspective as we head into the holiday season and the end of the year. Being 25 is nice. And if you’re wondering how to make the best Brussels sprouts? Or if you know a Brussels sprouts hater, just know that all you need is a little bacon some onions and maple syrup to change their mind. Plus this is a side dish that doesn’t require the oven–bonus! Heat a large saute pan over medium-high heat. Add oil, bacon and onion. Cook stirring frequently until cooked, about 5-7 minutes. Remove from pan and set aside. Add Brussels sprouts and 1/4 cup of water. Cover and cook for 7-9 minutes, shaking the pan frequently to ensure even cooking. Add bacon and onions back to pan, season with salt and continue cooking for another minute. Remove from heat, stir in apple cider vinegar and scrape up brown bits from the bottom of the pan. Stir in maple syrup and sage.